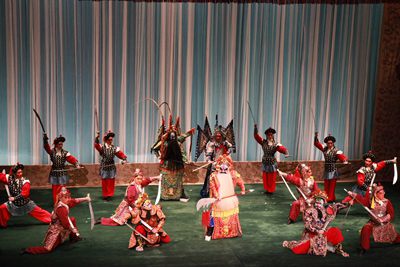 On 13-15 October 2016, the reputable Peking Opera performers Yu Kuizhi, Yang Chi and Li Shengsu led a group of 65 actors and actresses from the National Peking Opera Company to Britain and brought the classic The General and The Prime Minister and Legend of White Snake to the London stage. The General and The Prime Minister debuted on the evening of 13 October at the Peacock Theatre London. Chinese Ambassador to the UK H.E. Liu Xiaoming and his wife Madame Hu Pinghua watched the performance along with an audience of over a thousand local enthusiasts. The brilliantly performance of the artists as well as the well-known characters and the fascinating story line drew cheers and applauses from the audience, and ended in a long standing ovation. Sue Owen, Permanent Secretary from the Department for Culture, Media and Sport, Martin Albrow, famous scholar and member of the British Academy, and Mrs. Albrow marveled at the artistic charm of the traditional Chinese opera, and its philosophical ideas. Ms. O'Neill, Chief Operating Officer of the Royal Opera House, expressed how she enjoyed the melody, singing accompaniment of the band and the gripping and intricate plot. Audience from the local Chinese community were thrilled to be able to enjoy this high-level Peking Opera performance from their motherland, and hoped to help contribute to the promote Peking Opera in the UK. 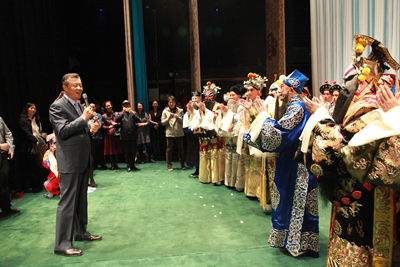 After the performance, Ambassador Liu visited the crew and extended his congratulations. He thanked the artists for bringing this wonderful show all the way from China. At the beginning year of the "golden era"of the China-UK relationship, and shortly after the British Prime Minister Theresa May attended the G20 Summit in Hangzhou for and held a bilateral meeting with President Xi Jinping, he said, the Peking Opera tour in London was timely. The Chinese and British two leaders reaffirmed their shared commitment to building a Global Comprehensive Strategic Partnership for the 21st Century and making joint efforts to create a "Golden Era" of China-UK ties. The "Golden Era" needs "golden results". It also needs "golden performance" like that of today. Ambassador Liu expressed his hope that the Company could make more contributions to promote China-UK cultural exchanges and add more splendor to the "golden era". 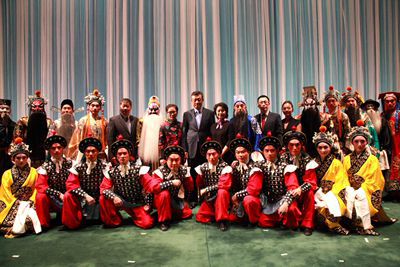 The visit of the National Peking Opera Company was at the invitation of Sino-Link and it's the third trip to following the two successful visits in 2005 and 2015. The General and The Prime Minister and Legend of White Snake will be staged twice each in the UK.